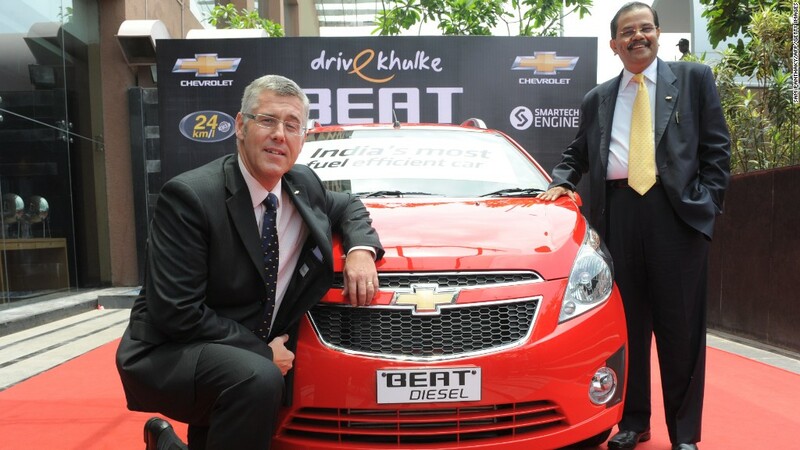 Tata Motors Managing Director Karl Slym, shown here on the left in a file photo, has died. Indian automaker Tata Motors confirmed Monday that the company's managing director, Karl Slym, has died after a fall from a Bangkok hotel. Slym joined Tata Motors in October 2012 after holding senior positions at General Motors (GM) in India, and had been implementing an ambitious turnaround plan at the time of his death. "Tata Motors deeply regrets to announce the untimely and tragic demise of its Managing Director, Karl Slym, in Bangkok," the company said in a statement. Police Lt. Somyot Boonnakaew, the Thai officer leading the investigation, said the death was being treated as a possible suicide, and that a note had been found in Slym's 22nd floor hotel room. Boonnakaew said that an autopsy will take about one week to complete. Slym was in Bangkok to attend a board meeting of Tata Motors Thailand, a company spokeswoman said. Shares of Tata Motors (TTM) tumbled almost 5% in morning trading in Mumbai as investors reacted to news of Slym's death. Tata Motors also owns Jaguar and Land Rover brands. Tata Motors has been hard hit as part of the broader global economic slowdown, and posted a 42% sales decline in December over the previous year. The automaker is expected to release third quarter earnings on Feb. 10. --CNN's Kocha Olarn contributed reporting.